"I learned so much from Keith, and I'm excited for you to learn, too!" Be sure to check out Part 1 of this series, where Keith offered some great tips for small living rooms and kitchens. Take it away, Keith! Today, I’m chatting with Kirsten about what’s working well in her small space, and offering ideas on how she can maximize these areas even further. In part one of this series, we looked at the entryway, living room, and kitchen. 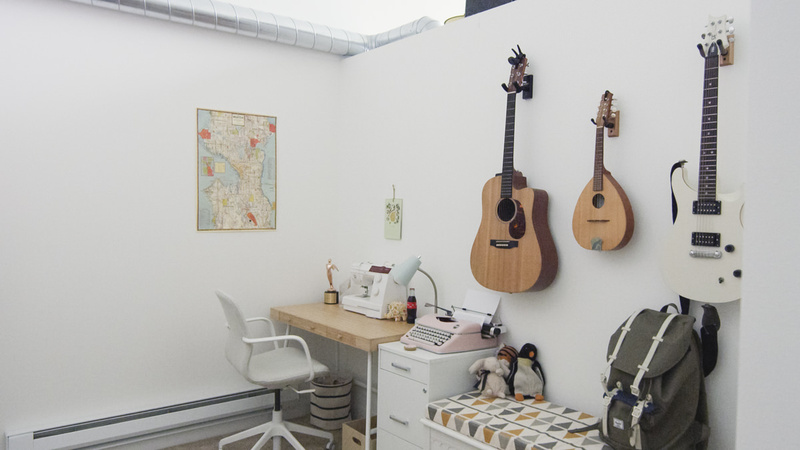 Today, we're looking at two spaces: a multi-purpose room which doubles as her office and laundry room (and has zero overhead lighting, unfortunately), and the bathroom. Kirsten has what she calls a "weird spot" in her apartment. The space was originally meant to be a bedroom, but because they decided to loft their bed (more on this in the next installment)v [link to part III], the room has become a nondescript secondary space—a multi-purpose room that sees a range of activities from working to playing music to sewing to doing laundry. There's a lot going on, which makes it difficult for the room to look good while functioning for all those needs. I'm always looking for ways to create functional, beautiful storage solutions. 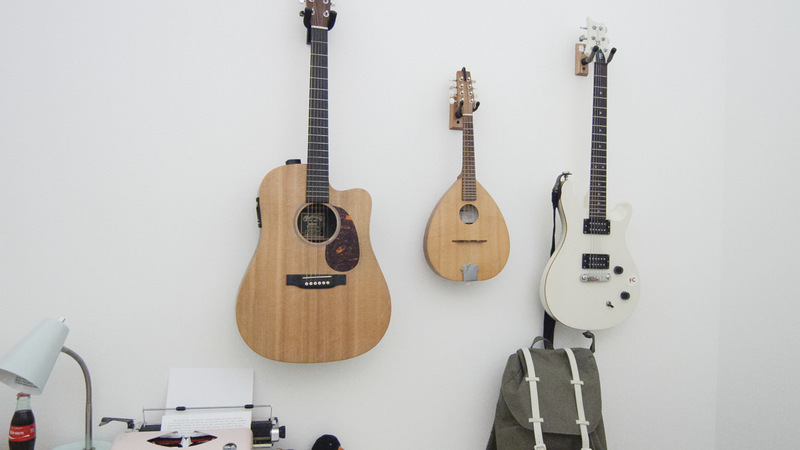 Kirsten and her husband hang their instruments on the wall, which is brilliant. Not only are they off the floor, but the instruments remain accessible (and they present well enough to function as art). Kirsten has a little work table and cushioned bench in here, but to fashion even more surface space, create or commission a large piece of art on a sturdy surface—maybe 30” x 48-60”. Mount it so the base is about the height of a table—or about 30” above the floor. The art is cleverly hinged and latched to the wall so it can transform and fold down into a work table. When it's down, it's a great, big place to spread out and work, and when you need more floor space, it folds back away. Because the space also works as a laundry room, Kirsten is often hang-drying clothes. Racks that fold flat or retractable clotheslines are great for small spaces. 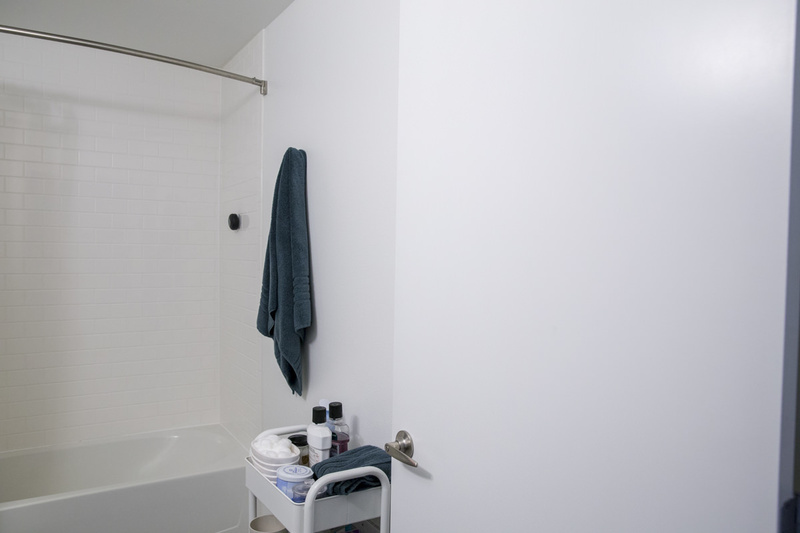 Building in cabinets is another option—particularly for those who aren't renting. I'm always looking for storage solutions that look clean, composed, and pretty when they're not being used. 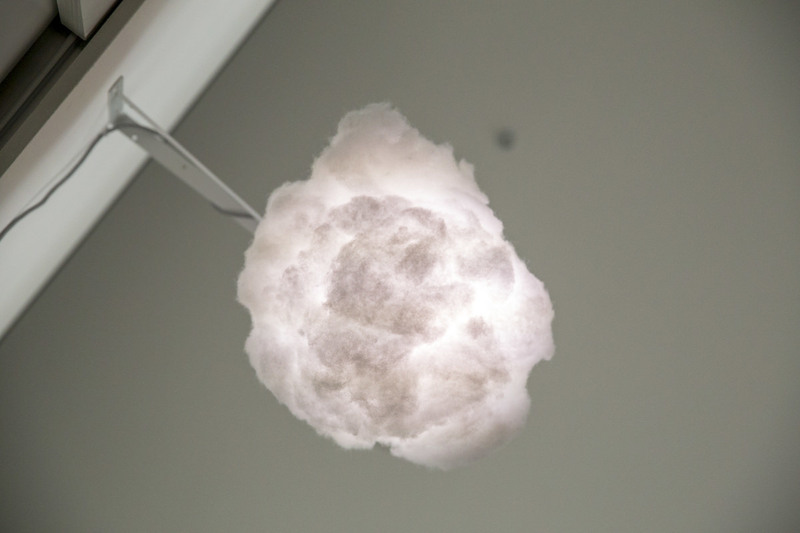 The room has no overhead lighting, and while a lamp (like Kirsten's DIY cloud lamp) is a great option, it doesn't provide the amount of light she needs when the sun is down and she's working on a project. The space could really benefit from torchieres—tall, slender lamps that shine upward, like a torch—in each corner of the room. They don't take up much space, and because they shine upward, the light bounces off the ceiling and floods back into the room. Kirsten has a washer and dryer in her unit, which is great, but they're in a closet with wide by-pass doors where you can only access half of the closet at a time. There's little room for storing clothes and shoes (or even storing softener and detergent). This is where dressers and shoe storage come in. 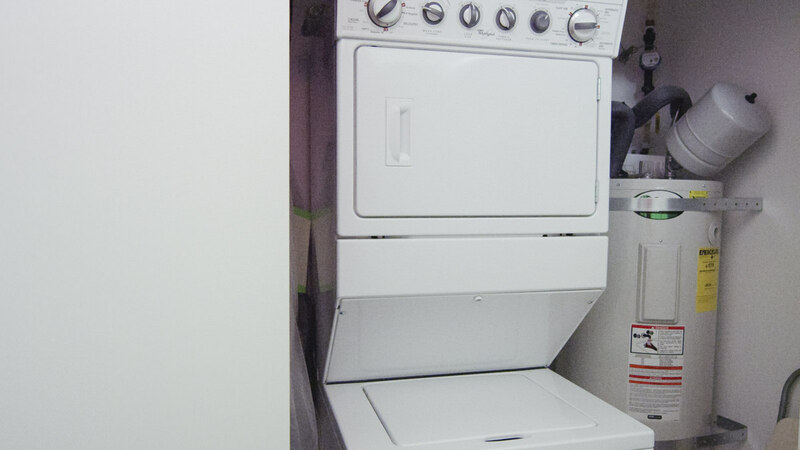 A quick measurement of either side of the washer-dryer unit will inform what size of container, bin, or organizational unit with sliding drawers could fit in the space. There's always the opportunity for a custom build-in, too—a full-out pantry-type situation could be fantastic here. If you have the opportunity for hinged doors instead of sliding doors, that'll open up even more storage possibilities. The back of the door is great for over-the-door hanging storage solutions, whether it's for shoes, coats, bags, or scarves. Kirsten and her husband's bathroom is decently sized, and includes a fair amount of counter space, which is great. In the pass-through space, they've added a three-tiered metal cart to stow toiletries, towels, and everyday products. And like many bathroom cabinets, there's ample space beneath the sink but not ample shelving, which means a lot of the space goes unused. 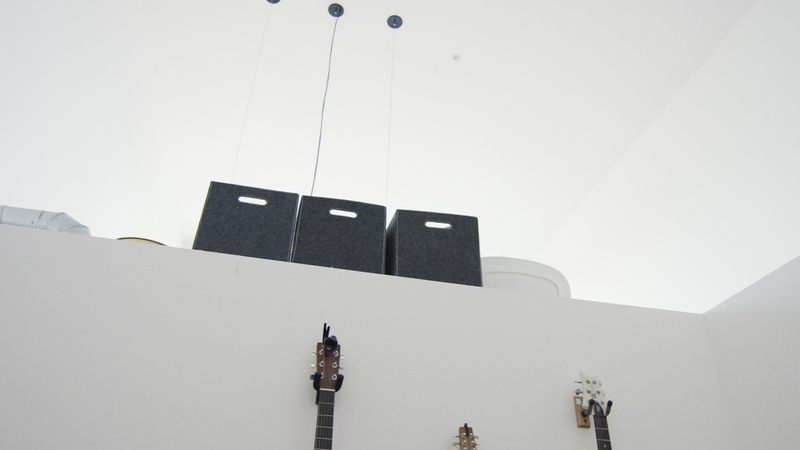 This is where auxiliary storage comes into play. Measure the space, think about what you'll be storing, then hop online or head to the store for a container with shelves or drawers that can easily tuck into the void. This is how to really maximize the space. We can't forget about guests, either. Have an "oh no" drawer that you can quickly sweep toothbrushes, toothpaste, makeup, and anything else into. These drawers are great for company (and an instant clean look). This doesn't just apply to the bathroom, either—keep an empty basket in each room of the house for a 10-second tidy. The bathroom is also a place of solace, particularly if you love a spa experience. With a few adjustments, you can enjoy that occasional luxury in your own bathroom whenever you can make the escape. A nicely sized side table or tray provides a great spot for anything you need to reach during a soothing bath, from essential oils and bath salts to a good book. 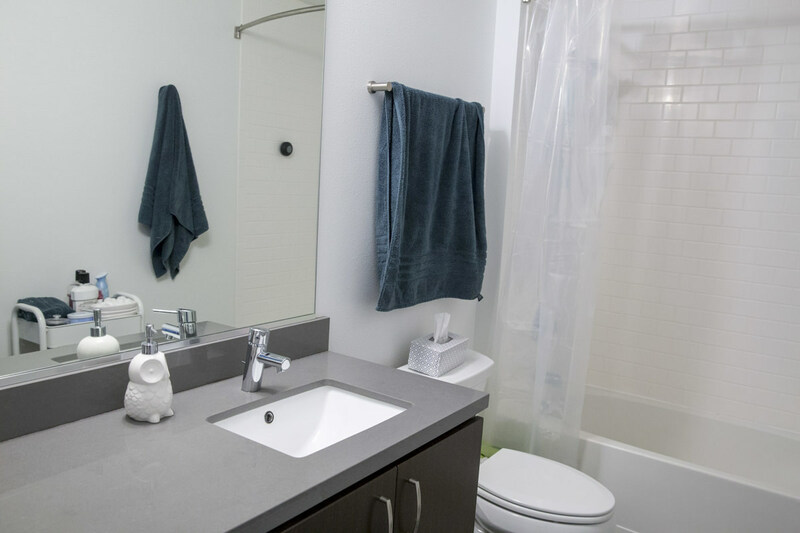 Like every other room in your home, a well-designed bathroom should restore you for all that life brings your way. Check out the final installment of this series: the bedroom. With a 4x4 and few other simple materials, you can easily create an outdoor variation on the classic game!